The Gravel Hits Just Keep A Comin'! This year has to be some sort of a record from the standpoint of new gravel road riding events. I really should compile a list and get all the data together, but really, nary a week goes by that I don't post up something on Gravel Grinder News about a new gravel event. Many of these events are in and around Iowa too. The re-named Buffalo 105, the Buck-Fifty X-gravelganza, and the Illinois based GGGRRR are just a few of the most recent additions to the calendar of late. Out of all of the three aforementioned events, the Buffalo 105 is the shortest one! So, you can really "get yer gravel on" and not have to travel very far for any of these events. The bonus is that most of these new events are free too. Don't have much for a travel budget and still want to have fun? Maybe one of these events, or others like it, will fit yer bill. Now we've got The Westside Dirty Benjamin, The Dirty Lemming, and the Heck of the North to take us all the way through the summer into fall, plus other events you can find out about here. So if "the Rag-bree" ain't yer thing, and you want more adventure, challenge, and fun, go gravel this summer. There really isn't any reason not to now. Labels: Gravel Grinder News, gravel grinder. Did I mention that I did another ride this past weekend? No? Well, I did. It was a quick out and back on the entire Green Belt trail. I didn't stop but once at the halfway/turn around, and I pushed it pretty hard. Why? Well......I keep thinking about December and early January when I was getting ready to do the Triple D event in Dubuque. I was riding extra times, at night, and longer after work. I had a goal in mind. I think I benefited from that and it got me to a better place health and fitness-wise than I had been in. I purposefully put off doing anything that smacked of "Training" after the Renegade Gents Race in early April due to Trans Iowa. I mean- it isn't like I need to stress myself more at that time! But now I think I need to get a focus on an event, or goal to aim for. Some motivation to do that little bit extra to take it another notch higher. And I think I have just the thing. Check That Off My List! It has been a few years, maybe going back to 2008, or '09, since I have even tried to do this. But it has been on my bucket list of things to accomplish on my bicycle ever since. What is that? Why, Frank Brothers Hill on a single speed, of course. Singular Gryphon: The rig of choice for the task. I used to do a lot of gravel riding on a single speed. The Karate Monkey was the sled back then, and I used it on some really long rides. One of those was a route that took me into central Tama County and through some mighty hilly country. There are some real gut-bustin' climbs down that way, but one in particular always defeated my best attempts at getting up it without walking. There is a farm situated at the top of this climb and the mail box on the road is emblazoned with "Frank Bros". So, I named the hill "Frank Brothers Hill", naturally, and I cursed it every time I had to walk it. One thing led to another, and I fell out of the habit of doing long gravel grinders that took all day. Twenty Nine Inches started taking up all of my free riding time too, so gravel grinders were just an occasional extra flight of fancy that I got to do over the past several years. Frank Brothers Hill was something I had on my mind to accomplish, but I wasn't making the time to get around to it. Well, that was going to come to an end over the Memorial Day weekend, and my plan was to get out at some point to conquer that beast. Saturday Mrs. Guitar Ted had several activities planned, so that day didn't work. Sunday was a good opportunity, but due to certain events, it didn't happen. That was probably a good thing, as it was super windy and very hot. Monday looked better, as far as weather and activities were concerned. P Avenue looked great for just having been rained on. So Monday rolls around and I have the Singular Gryphon readied for the attempt on Frank Brothers Hill. I get clearance from the family to go, and I loaded up the truck and headed south. Now- back in the old days- I would have done this ride from the front door. It would have added about 50 miles or more to the loop, and I knew I wasn't ready for an 80 miler all on gravel. No- not now. Not on a single speed. So, I took the Gryphon down to Traer and set off from that point. The weather, which I had counted on being a lot better than Sunday's,was only slightly better. Winds were out of the Southwest at 20-25mph with higher gusts. The temperature was in the upper 80's too. This wasn't going to make my approach to Frank Brothers Hill very easy, as it meant I would be in a headwind all the way until I got there. We had gotten some rain overnight, so another concern that I had was P Avenue, which was my main route south. It has a mile and a half section of B Maintenance Road which I thought might be too wet to ride, but much to my surprise and pleasure, it was very nice and fast instead. Apparently, the recent dry weather had been enough too allow the roads to absorb every drop of rain like a sponge. I saw a man and a dog walking up the final climb from dirt to gravel and when I got close, I could see it was the farmer who lived on the hill there. He may not have remembered me from our chat during T.I.V3, but I did. He asked, "Are ya gettin' in shape fer that Rag-bree?" I said, "Well, I'm gettin' in shape for something!" We exchanged a few pleasantries and then I kept on chugging up the hill. Seeking shelter from sun and wind. After the ascent from B Road to gravel again the hills kicked in with earnest. These would be "testing hills" where I was going to see how I was fairing with my body for the day, and to make sure I had decided just what I was going to do on Frank Brothers Hill when I got there. Things were feeling pretty good, so I had a positive attitude about the outcome. That was something that was easily held on to in my mind until I turned westward. The wind was switching to more out of the west as I went, and when I made the turn west, a turn I hadn't taken in several years, I realized that the memory of the hills had faded somewhat, and the wind was stronger than I had anticipated. Suddenly all those good feelings and thoughts were in jeopardy. I was struggling to make the climbs now already, and I had a handful of miles till I got to Frank Brothers Hill. How would I do with my reserves being taxed so heavily now? Well, that's always been the thing about Frank Brothers Hill. It isn't so much that the hill is bad, (however, it is pretty steep), but it is all the big monsters that come ahead of it. Now I had a head wind, and many spots of fresh gravel to contend with. I decided I needed to take control of my situation with a stop to calm down. I found a nice turn in to a gate and got into some shade. Once I got myself calmed down, I started back on the bike. I hadn't been down this road in years, but my memories of it were still pretty good. I knew what to expect ahead, and I kept my efforts in check, when I could. I needed to conserve the most energy possible to bring to bear on that climb. Cresting a hill, I saw it shining in the sunlight ahead. Frank Brothers Hill. I thought, "It doesn't look so bad. I've climbed hills as tough as that already today." I also tried keeping my self positive, as you can see! Now the situation here is that there is a steep little roller preceding Frank Brothers Hill that really taxes your legs. Then a quick down, across a small bridge, and then you are going up the hill proper. The hill kicks in about half way up with this ridiculous pitch, which takes you to a small crest and a dramatic lessening of the grade with about 20 yards to go until the mailbox, which marks the end of the climb.Overall it is maybe a quarter of a mile long or so, but like I said, the grade is a killer. Frank Bros Hill wasn't the last big one of the day! I did get the seated part a bit farther up the hill then I thought I would. However; by this time I could see that Frank Brothers Hill had been overlaid with fresh gravel recently, and it was pretty deep. So when I got out of the saddle, I had to measure my efforts really closely, or I was going to spin out. Spinning out and losing momentum meant defeat. I wasn't going to go down like that if I could help it. Many years ago on a Guitar Ted Death Ride Invitational, I had made a wrong turn in Tama County and was leading my ride up a similarly steep grade. I was thinking of bailing off my ride and walking when Matt Wills, a rider from Lincoln, Nebraska, came slowly by me, out of the saddle, as if he was walking on his pedals. He made it all the way up. It was a lesson I never forgot. I would, in later years, try to do what Matt always did on his single speed when the climbs got tough. Generally, it works out very well for me. This climb finds me doing the same thing as Matt- walking up slowly on my pedals, when ....rrripppp!- my rear tire lets loose. Somehow I got the other leg around and kept moving forward. That was close! About this time I saw a cleaner patch of road and I make a snap decision to swap over to it, to prevent another slip of the rear tire. One more revolution to get there and........made it! Now I afford myself a look up the road to ascertain how long this good fortune of finding a clean patch would last. It was then that I saw I was very close to the break where the grade flattened out a bit. Well, needless to say, I was relieved and I made it, of course. It was touch and go there for a minute, but I made it. As I cruised up to the mail box to get an image of it I said to no one in particular, "Well, I can check that one of of my list now!" I snapped my camera off, pocketed it, and rolled off without another thought. I still had about 15 miles to go, a few more big rollers, and now, a tailwind. It was a good ride. A good start to training for the GTDRI, and a good day to cross off Frank Brothers Hill as unridden. Another round of Barns For Jason today. I hope ya'all had a great Memorial Day Weekend! Hope ya Had a great weekend! Spent most of today swapping out wheels and tubeless tires. The testing must go on, and with Mrs. Guitar Ted out to a graduation open house, (tis the season), I used my home time to get 'er duuun! So let's see now- I pulled the Rubena Kratos tires off the Sawyer and swapped them over to the Breezer. The WTB Bronson folders on the Breezer went on the old Sun-Ringle' Charger Pro wheel set I had sitting there, since the Sun-Ringle' Black Flag wheels the Milwaukee Bicycle Company 29"er had on it were mounted with Geax AKA TNT tires, and they weren't gonna come off. Instead, I refreshed the sealant in them, and then left them alone for now. Finally, the Sawyer got a Geax AKA folder out back with a Bontrager 29-4 Gen I tire up front. Did ya catch all of that? With all the rain on Friday and overnight to Saturday, the off road trails will be a bit too mucky for good test riding. But, hopefully I get in a big gravel ride. I have a bit of a score to settle, and if I am successful, it will be something I have been waiting to "check off my list" for several years now. Hopefully tomorrow will be out of The Lab, and into the Frying Pan. SRAM announced Friday that a new XX1 group was being developed for sale later in the summer. That in itself isn't all that newsworthy, but the details behind it are. The one thing that seems to be catching everyone's attention is the fact that the cassette on the new group is 11 speed. The obvious Spinal Tap references aside, this might be a concern for many who fear being "forced" to use less durable, more expensive, odd mountain bike components. I can see where the mere thought of 11 speed mountain bike componentry is going to ruffle some feathers and for good reasons. However; I don't think this is where SRAM is "sticking it to ya". Rather, I see this as something that might be good. Oh sure, I went and rolled my eyes a couple months back when an industry contact whispered the words "10-42 eleven speed" over the internet to me in an e-mail. "42 tooth cassette cog? Really!? ", I thought, "That's nuts. That's insanity. It can't be for real, can it?" Well, crazy like a fox......maybe. You see, this new stuff is not meant to have a front derailleur or multiple front rings. It is meant to be only a 1X option with a wider gearing range. In many ways, this makes a lot of sense. I've always said front derailleurs were the weak link in a derailleur drive train. They shift harder, and in the case of mountain bikes, foul easier than the rear does. Front shifting makes you lose momentum because the jump in ratio is not a close one, and probably will require you to make multiple shifts in the rear to get close to where you were in terms of cadence and speed. If a system has a wide enough range to climb your terrain without a front derailleur, why not use it? I think it makes loads of sense. Then there is the aspect of full suspension design, and to some extent, hard tail 29"er design. Getting rid of a front derailleur allows designers a lot more leeway in terms of tire clearances, chain stay lengths, and suspension designs. The possibilities are enticing in this regard. The 1X10 on this bike has been really good. Obviously, there are some proprietary bits. The shifter and derailleur are specific to this group. And really- do we need a 10 tooth cog? Finally, one has to wonder why we even have to do this with eleven speeds at all. Why not just stick with 10? 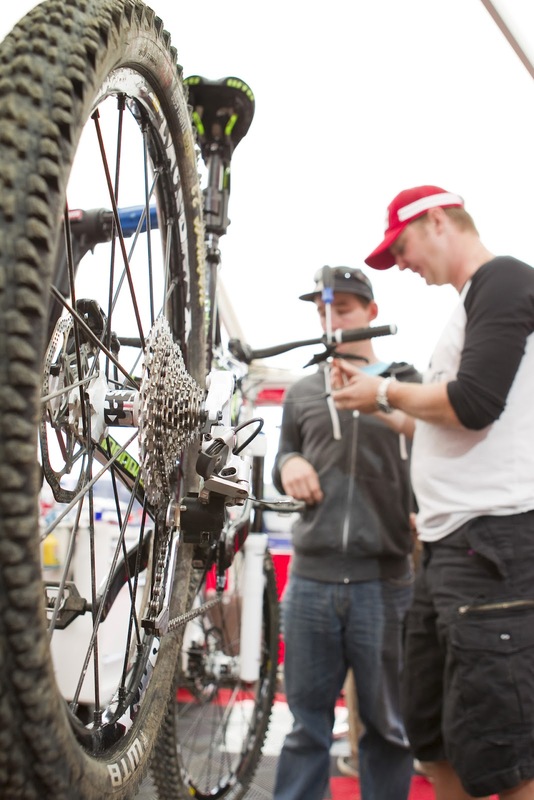 Durability is often brought up in discussions dealing with 10 or 11 speed systems for mountain biking. It is true that early 10 speed road stuff was abysmal as far as longevity. However; I've been finding that has improved. In fact, my 1 X 10 titanium Mukluk has been holding up rather well through snow, mud, sand, and dirt. This with a Shimano 105 10 speed chain, by the way. Of course, an 8 speed, or heck, a 7 speed drive train would last far longer and may be all anyone would ever need. I still think an XT level, all aluminum 7 or 8 speed group "for the masses" should be produced with durability, efficiency, and moderate costs as design goals. But this new 11 speed XX1 group might be pretty dang cool on the right bike. There will be several drive ring choices all the way down to 28T and Grip Shift and triggers will be supported. I may just look into it for By-Tor the Titanium Mukluk. I think a tad lower end on the range would be just what the doctor ordered here, sans front derailleur and shifter. Still running tubes? Here is a reason why you need to stop doing that. I was riding home yesterday when I heard a "crunch-THWAK!....tic....tic....tic...." It was this pencil sized twig that was on a branch I ran over that punctured my Bontrager 29-4. Fortunately, I had sealant inside, and I was able to continue on home with no loss of air pressure. I'll probably patch this tire and re-use it tubeless again. Yay tubelessness! I'll be doing another 3GR tonight from Gateway Park at 5:30pm. Come on over and join in on some gravel road good times. Once a solid group of regulars forms, I'll introduce some new routes. UPDATE: Ride cancelled due to rain. Next week, same time, same place! Obviously, with the big holiday weekend upon us, there will be lots of riding going on. I hope to put in a longer ride sometime this weekend in Tama County. I need to start getting some fitness for the Guitar Ted Death Ride Invitational coming up July 14th. That ride will be about 120 miles and there will be plenty of big hills in Poweshiek and Jasper Counties to prepare for. To all who have served, and are serving- Thank You! Have a safe and fun Memorial Day Weekend and I hope the rides and good times are plentiful! Many of you long time readers have perhaps remembered that I had a go-round with Gates Carbon Drive belt systems a while back. Well, here is a "long term" update on what has been happening with that since my last update. In my last update I described how Gates had been getting me set up with belts for the Sawyer, which is a Gates compatible design from Trek. I had two belts and due to their inappropriate lengths for the Sawyer, there were certain issues with performance. Gates then got the "Goldilocks" belt out which solved fitment issues and allowed for the proper tensioning of the belt. Update: So I have had the Sawyer set up with the proper belt on it since last fall and throughout the winter and spring I have finally come to trust this belt and use the bike like I would any other single speed. Yes- there was a trust issue. When you single speed, there are times when you are applying such a great force to the pedals, that if a chain broke, it would result in a catastrophic event to the nether regions, face, and maybe the knees as well. Let's just say- it wouldn't be a good thing! So, when I first started having ratcheting issues with the belt driven systems I was trying, I was loathe to hit the gas hard going up a hill, like I would on my chain driven single speed rigs, for fear that a belt ratchet event would result in severe smack-package. I am happy to report that as of yesterday, that same level of trust I have in a chain driven single speed was finally attained on a belt driven single speed. Okay- one hurdle passed. It works grunting up a hill out of the saddle and without any noises at all. Okay, so you probably can now get a Center Track system and set up your single speed to be a reliable, noiseless, smooth bike with a maintenance free-ish drive train. (You still have bearings to deal with.) However; as my example so plainly points up, the switch between gearing ratios, or bikes, can mean entire new belts and cogs. Expensive and not practical for the masses. So, the only thing I can't speak to right now is longevity. But hopefully I'll have this together long enough to ferret that out. Stay tuned for another update on that.........in the future. Gravel Grinding Our Way Back To Nothingness? Every year this whole gravel grinding thing, the rides, the races, the "culture" of gravel grinding- well it all just amazes me by how it keeps chooglin' along, getting "bigger" every year. I've been hit up by a few media folks about the whole shindig out here in the Mid-West and beyond. The "outside world" wanting to know just what the heck is goin' on out here. I guess it is kind of amazing. I mean, I've added more events on Gravel Grinder News this year than in any other besides when I first started the site. Events keep getting "bigger". More attendance, bigger side attractions at some events, and definitely more media covering events, and celebrating them. 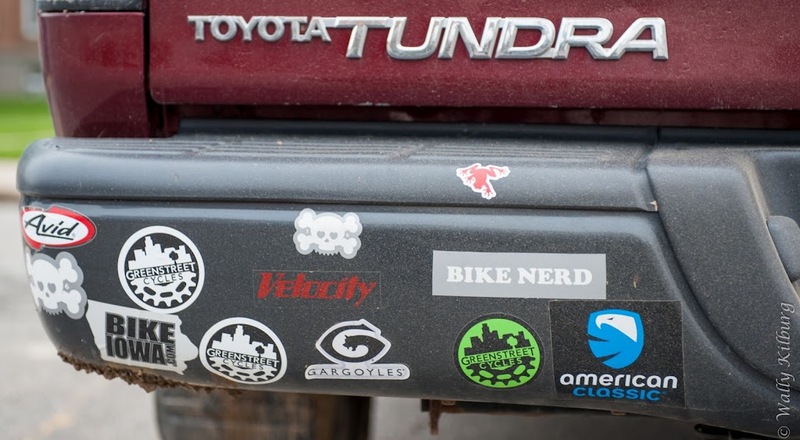 The "Gravel Metric" has those funky, fun promotional shorts, Dirty Kanza has video contests for participants, and even in-race video available on-line, Even documentaries and movies are being made about gravel grinders like the Almanzo 100 and Trans Iowa. Not only visual media, but print media has been chasing the mystery of gravel grinding as well. Trans Iowa itself being written up in a book, in magazines, and in various articles over the years. Heck, now bicycle manufacturers are even designating product as good for "gravel grinding" and writing such in promotional ads and catalogs. So....just where is all of this going? Maybe it is getting to the point of becoming a something else. Maybe it is the end of the salad days. Maybe it's, (as my Dad used to tell me when I thought I was "really sumpthin"), too big fer its britches. I wonder sometimes, and it reminds me of this old 63XC article about single speeding. Or maybe we're just evolving into.....I don't know, something more "mainstream", I guess. Whatever it is, I feel it has changed a bit. Is it bad or good? I can not say. And maybe it just doesn't matter. Just like Sir Corson states in his rant on single speeding and "cool", gravel grinding won't go away as long as people are doing it and having fun. Forget about all the media, films, documentaries, magazine articles, and hob-nobbing that goes with it. Just go ride. And that is just what I intend on doing. Well, I got something done! This might take an eternity to chip away into what I had envisioned, but at least I have taken one step forward here. First, I needed to dismantle the old wheels. That seems simple enough until you go looking for that Atom freewheel removal tool. Ahh! But the shop has a Phil Wood one, back in the day, it was used a lot, so I borrowed it to use for the project. Okay, so I twisted that off without much of an argument. Makes my theory that the bike was barely ridden more plausible. Anyway, then comes the cutting of spokes. Quick work with my heavy duty nippers frees the hub from its connection to those old red label tubular rims. Then, I started fiddling with the hub, turning the axle in my hand as I thought about my next step. That was going to be a hub tear down, but......two things popped into my mind. One- the axle was beginning to turn more freely after a few minutes. Could the grease still be good, only needing a bit of heat to make it viscous again? Two- the Record hubs have metal clips around their centers covering a zerk type hole for greasing. Hmm......grabbed my needle point greaser and started pumping. Old lithium grease squozed out of the seals, slightly brownish, but still slippery. Then the new grease popped out behind. No contamination to be seen. Good. Spinning the axle nicely afterward, I decided not to crack open the hub. Likely I would only find everything in order. Now on to a bit of external cleaning and then wheel building. One thing about Project LeJeune gives me pause now. The fact that it is a skinny tubed steel bike might be an issue. Yes, the ride on the old Raleigh Grand Prix showed me that. That frame was noodling and bouncing around like mad on my ride, making me think I was about to see the frame buckle at any second. I don't know, maybe I am overstating the issue, but the frame was getting knocked about on the chunky gravel quite a bit. Well, the LeJeune might just be the same deal on gravel. Maybe. While urban riding was fantastic with this tire, I needed to find out how it would do on our exceptionally chunky gravel in Iowa this spring. Urban rides had shown a good resistance to cutting and punctures, so the rocks didn't pose an issue in my mind in regards to flatting, but rather the narrow profile and lower volume of the tire, (than I normally run on gravel), had me concerned. For whatever reason, Iowa has used a lot of freshly laid chunky gravel all over the state on the gravel roads this spring. Normally we see very little of this, but when we do, it causes issues with any sized tires, but especially with narrower ones. This was part of the reason I held off riding these for as long as I did, hoping for some faster, less deep and chunky gravel to test on. On the days I rode this tire on gravel the chunk was mostly in full effect, and allowing for that, I will say the USH held its own out there. Yes- it got deflected and there was some tendency to get washy, and cut into deeper gravel, but that would be exactly what I would have expected with any 35mm tire. When I did find more "typical" gravel road conditions, the USH was right at home. It rolls fast and feels smooth. The control on sandy, finer gravel was enhanced by the flattish profile to the crown of the tire and to some degree, the aggressively "file treaded" outer sides of this tread pattern. I'm still not sold on the diamond shaped blocks on the outer edges of the USH, but when you do hit real dirt, these do enhance cornering. So, let's say you do a bit of minimum maintenance road that requires cornering, or probably most likely, a single track session on buff trail- Then I can see these uniquely designed side areas of the USH as being worthwhile. For my gravel riding, they are just odd. They don't hurt anything though, so there you go. And the center tread is smooth, so road riding isn't affected by the diamond shaped file tread, and the road riding stays quiet with low rolling resistance. The Clement X'Plor USH is a good tire for urban commuting, has a nicer feel the longer you ride it, and may be just the thing for gravel riding if your gravel is hard packed, free from loose spots, and has smaller rock on the road surfaces. At least in its currently offered 35mm width. At 440 grams, it is a very reasonable weighted tire, has decent grip on cornering on pavement, hard packed dirt, and hard gravel pack. I would be very careful about doing any leaned over, high-ish speed cornering on the USH on typical gravel though, as the USH just doesn't have the volume or width to do that sort of thing. Loose, big, chunky gravel will ping this, (or any other tire this size), all over the road and loose dirt, sand, and deeper gravel will not be friendly to this tire either. Expect the USH to cut in and want to wash out in those types of road surfaces. The tire seems reasonably tough and puncture resistant though. In the end, I see the X'Plor USH as a specialist tire for touring on multi-surfaced routes, or for certain areas of the country where the rural roads are more suited to the USH's strengths. For a more "all around" gravel tire, the X'Plor MSO, with its tread pattern and bigger volume, seems more suited to use as a "go to" gravel grinder tire. NOTE: Today QBP is expecting these tires to be in stock, so ask your local bike shop to check on availability. Note: Clement sent these tires for evaluation and review at no charge. I am not being bribed, nor paid to give my opinions and thoughts on these tires. I will strive to give my honest thoughts and opinions throughout this evaluation. If you didn't catch my report elsewhere, I actually did get a camera in the kit for the 3GR Friday. Not only that, but I actually got it out and used it! Once again it was just a duo out on the gravels. My co-worker Ali came along for her first gravel grinder. I think it all worked out okay for her. We did sort of figure out she is a natural born single speeder, which was cool. I was also cool to see that she was doing just fine on the 70's era Kabuki with 27 X 1 1/4" tires. No flats, seemed to be just fine. Only issue I heard was that she experienced a bit of tire spin on a steeper climb. So next week we need to see a few more of you out there. Bring any ol' bike, get your riding gear on, and let's ride in the country. It is fun, challenging, and you'll see stuff you can't see riding the bike paths and paved roads. Hope to see ya out next Friday at 5:30pm at Gateway Park. Make Mine Steel: Black Mountain Cycles "Monster Cross"
Since I started out on this "steel for frames" deal Monday, and asked "why steel? ", I thought I'd show you all where I put my money and why. Each of the bicycles I will be featuring will be bicycles I bought and paid for. Yes- I like steel framed bicycles! Black Mountain Cycles "Monster Cross"
You regulars knew this one was coming, didn't you? My "Orange Crush" rig is one of my favorite bicycles. Of course, it is a steel frame and fork. Black Mountain Cycles is primarily a bicycle shop which is run by industry icon, retro-geek, and regular cool guy, Mike Varley. Mike may not be known by a lot of you by his name, but you've heard of his work. Masi? Haro Mountain Bikes? Yeah, Mike Varley had a hand in those company's bicycle designs. So, after Mike cut outta the grind of being an industry dude for those companies, he set his sights on being the sole proprietor and mechanic/salesman at Black Mountain Cycles. He then decided he'd do a modest line of cross and road frame/forks. Steel of course! Mike drew from a deep well of vintage knowledge, modern steel road/cross geometry design, and his own design details he liked and brewed up a nice mix of all of that which is what you see here. The Black Mountain Cycles "Monster Cross". Well, I checked his design out and it ticked a lot of my boxes, so I bought into it last year, and I am glad I did every time I ride this bike. I've written reams already about this bike, so I will not cover old ground here, but suffice it to say- I like this bicycle a lot! Now the bike isn't perfect in my eyes, but it is darn close. I would tweak a few items, but really, it is such "fine line" stuff, I won't even mention it. By the way, I am super happy I ditched the carbon fork and returned to the original steel fork. Astute readers will also note that I have recently swapped out chain rings. 46T/36T FSA rings are making my knees waaay happy! Special Note: The Clement Pneumatics X'Plor MSO tires on this bike will be available at QBP Monday!! I expect they will sell out the first batch very quickly, so get on the horn to your LBS and have them get you these Monday. I highly recommend them. Awesome tires. Remember yesterday's post when I said I wasn't too interested in a single speed version of a Fargo? Well, this here is the reason why. The Gryphon was a purpose built drop bar bike for 29 inch wheels that was developed right along the same time as the Fargo. Unlike the Fargo, the Gryphon was fitted with an eccentric bottom bracket shell. This allowed for use as a single speed. I had been carefully following the development of the Gryphon via Singular's blog, and when it became apparent that the Prairie Peddler would import these into the U.S.A., I decided to jump on getting one. I received my frame and fork at the annual Frostbike gathering at Mike's Bikes in 2010. I built it up with some nice parts and it has remained a single speed ever since. I kind of used the Gryphon as my Karate Monkey gravel grinder replacement, but I also did ride single track with it. In several ways, the Gryphon is the bike I wanted to have all along for myself since I put drop bars on my Karate Monkey a few years before getting this bike. While the Gryphon is similar to the original Fargo, there are several details that make it quite a different bike to ride. The Gryphon is not as long, is lighter, and has a livelier tube set. The fork is definitely more forgiving. it all adds up to a less rough ride than an original Fargo, but then again- the Gryphon is not a touring capable bike, unless you use frame bags. Even then, you'll want to watch the weight. A big load and these lively tubes won't want to mix well. The Gryphon is capable of handling a derailleur set up, but again, I have a Fargo! The Gryphon is really well suited to single speed action anyway. It has the unique feel of being "in the bike", but it is still easy to get out of the saddle on climbs. The Gryphon is also a bit shorter in the rear end, which gives it an advantage in single track over the original Fargo. Now that the new Fargo is here, the similarities on dirt are nearly equal. But my favorite thing is to single speed this bike on gravel with some fast, light racing 29"er tires. It rides sooo smoothly and climbing while out of the saddle and mashing a gear is met with good performance. So while the Fargos are nice, this bike has found a niche in my stable for sure. Good Luck! I want to wish all those racing the Almanzo 100, Royal 165, and Camp Ingawanis race good luck. If you are competing elsewhere, good luck to you as well! Ride yer bicycles, take pictures, and keep the rubber side down. The Fargo has been a bike I have had around since 2008 in the original form, but when the revised version came out, I didn't see any motivation to pick one up. I mean....I already had a Fargo. Right? 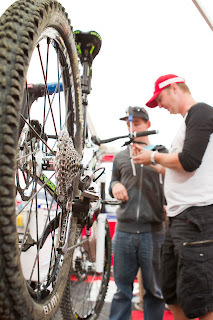 Well, a little demo ride at Interbike at Bootleg Canyon last September opened my eyes big time. This newer version of the Fargo was different. Better on dirt. I had to get one. Once again, Ben Witt figures into this steel story. I had been up to his shop and had seen a green Generation II Fargo frame sitting around. I asked after Interbike if he still had it, and he did. Not long after, I had it in my possession and built it up as you see here. My initial impressions from Bootleg Canyon proved to be correct for our trails back home too. The newer Fargo is much more adept at actual mountain biking than its predecessor, which wasn't bad at it, by the way. The differences are in the way it steers mostly. Thankfully, the fit is even more conducive to mountain biking as well. Now I have to admit that I have not ever ridden this one without the Thudbuster seat post. So, my impressions of how nice it rides are certainly colored by that. I will say that the fork is pretty nice in the traditional Salsa Cycles way, and I can detect that the frame is doing some nice "steel-like" things under me as I speed along the single track. I still have the "Gen I" Fargo, and for me, that is the ultimate gravel machine/ touring rig with fat tires. This one here is the best drop bar mountain bike I have. It just eats up single track like nobody's business. I may have to get a set of road BB-7 brakes and put some STI levers on this one to really get the shifting where I need it to be for "hot and heavy" single track action. The bar ends work okay, but I end up not shifting, or missing shifts when I get flying on the twisties. But that isn't a fault of the frame. I don't think I'd really change much here. There are some who would like a "single speed version", but there isn't any need for that for me. (You will all see why that is tomorrow!) No- this is almost spot on as it sits, and the frame is really great. This one has an unusual background. When 29"ers were first discovered by me during my early internet searching, I began to dream about designing something for the big wheels. There were not too many choices back in 2001-2002, and I had lots of sketches and doodles of ideas for 29 inch wheeled bikes. Maybe I could get one of these designs made someday? But then along came the Karate Monkey, so I put all of that on hold. Then along about 2006 I came to know a young fella by the name of Ben Witt. During that time I found out about a local-to-Ben custom bike builder by the name of Mike Pofahl. Ben found out about my sketches and asked if he could play around with the idea I showed him. By early 2007 there was an agreement to get the ball rolling on the bike. Ben massaged some geometry tweaks and details into the idea, and then Mike Pofahl did some more tweakage, and of course, brazed the frame up for me. Here you can see what it looked like bare naked! The intent of my idea was to pay homage to the four decades of mountain bike heritage of the modern era. The Pofahl features "twin laterals", which is my nod to Joe Breeze and the first purpose built run of 10 mountain bikes from 1977. The fillet brazing technique used to join the tubes here was used early on by several notable builders of early mountain bikes including Joe Breeze, Tom Ritchey, and Ross Shafer of Salsa Cycles fame. A further nod to the 80's is seen in my use of a drop bar. My nod to the 90's is in the anodized parts, the 90's era Race Face Turbine LP cranks, and Syncros 27.0mm seat post from my 90's Klein. Of course, the 2000's are represented in the 29 inch wheels themselves, along with the WTB Vulpines, which come from the mind of Mark Slate. He originally worked on the first 29 inch tire and helped bring it to market, which of course, is the Nanoraptor. The single speed bit? Well, that is also a nod to the 70's when clunkers and BMX were off road brothers and most all were single speed. Anyway, how does this oddball ride? It is kind of based on a Karate Monkey, but with longer chain stays. So, it is fairly quick handling up front, a trait Ben and I both were in tune on back in '07, and with the longer back end, it can be a real smooth ride, or it can hustle around a corner if you load the front end up with weight on the bars. Actually- come to think of it- it handles much like a Generation I Fargo! Which isn't a bad thing, by the way. Like I say- it is smooth riding, but there is absolutely zero torsional flex in this chassis. None. Those twin laterals take care of that! It is also not suspension corrected, which also aids in that lack of flexiness. She's a tad porky due to the extra tubing, but running it single speed helps keep overall weight in check. I would say this bike is best suited to long days when overall speed isn't a top priority. It can zing ya with its rigidness if you start to get "racy" with it off road. I used this set up a bit differently for a Gravel Worlds race in Lincoln. I got in over a 100 miles on it that day and it does nicely as a single speed gravel grinder rig. I still like to use it that way but then I do add a smaller rear cog, which helps pep up the speeds, obviously, but also the feel of the bike on gravel becomes less laid back. Usually I run a 38 X 18 on gravel with this, and on dirt, a 38 X 22. Changes? Well, I'd probably do a bit slacker head tube next time with more braze ons for racks, bottles, and Everything Cages. 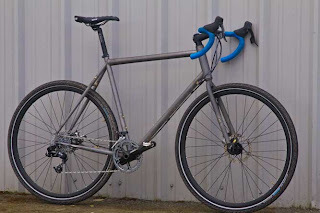 I could totally see this as my single speed off road touring/bikepacking rig. Since I started out on this "steel for frames" deal yesterday, and asked "why steel? ", I thought I'd show you all where I put my money and why. Each of the bicycles I will be featuring will be bicycles I bought and paid for. Yes- I like steel framed bicycles! Yes, this one has been around my stable for a while now. It still is one of my favorites too. So, just what is it that makes this bike so good? I often wonder why it is I like this one so much. I am quite sure I've never owned a bicycle that was set up in so many different ways. Not because I was searching for something I wasn't getting out of it, but more so because it just works so darn well no matter how I set it up! Some of that is due to Mark Slate's design, of course. Mark along with Steve Potts worked on some of the very first 29"er designs back in 1999. So Mark was able to draw on that design work when he penned the Blackbuck for his own brand, OS Bikes. The Blackbuck has a nice amount of exposed seat post, which is good for some smoothness, but I figure that the unique seat stay styling has something to do with it all here as well. Just my hunch, nothing "scientific" there. The front triangle isn't the stiffest out there, but it isn't a noodle. It works well. With a rigid fork up front, the Blackbuck's front end stays smooth. Add in a big, fat front tire and it's downright awesome for single speeding around these parts. So it works well with either a suspension fork, or not, and the handling is smooth, like a steel bike should be smooth. Added into this is the fact that there are less than 500 examples of the first series Blackbucks out there and it becomes a bike that has a little bit extra for being out of the ordinary. Top that off with it being designed by mtb pioneer, Mark Slate and it hits all my buttons for "cool mountain bike". The fact it is made from steel makes it ride the way it does, and look the way it does. It is durable, repairable, and, (as in the case of one Milltown Cycles mechanic's Blackbuck), customizable, if you want to take things that far. If I could change anything about the Blackbuck, I'd probably just add a 44mm head tube. Otherwise, it's about as good as it gets for a steel 29"er hard tail. I'll dispense with the expected cliche' about steel and why it is good for bicycles. . But I do like me some steel frame action. Yessirree. This Breezer is a good example, but there are others. 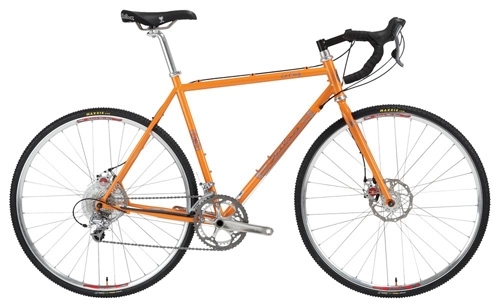 I own a few steel bikes- The Black Mountain Cycles "Orange Crush, my Singular Cycles Gryphon, the Salsa Cycles Fargo. My classic Of Spirit Blackbuck. Karate Monkey anyone? So it isn't just a few Twenty Nine Inches test bikes. I have several I've laid out cash for. I like steel bikes and how they ride. Why? Well, I will say other frame materials can ride as nice or nicer. I've ridden a carbon frame I liked real well. I've ridden an aluminum frame I liked just fine. I like titanium, but then, it is rather steel-like. (Just a lot more expensive.) However; I've ridden more steel frames that were at least "pretty decent" or better than all the rest, (full suspension bikes excluded). What's really kind of weird about all of these steel bikes, (well- most of them, anyway) , is that the technology behind them is.....uh.....ancient? Compared to what else is going on, these steel bikes are rather antiquated. It's funny because people still love the way they ride anyway- regardless of the "latest and greatest". To be fair, there is a lot going on with steel, you just don't see it much. Like that Breezer above. It has hydro-formed steel, a press-fit 92mm bottom bracket, and some asymmetrical chain stays which help keep the bottom bracket really stiff. Other builders are doing some really cool stuff with steel too, but for the most part, it is traditional methods of brazing, welding, and lug work that define steel frames. I think the long running use of steel has the techniques and designs refined to the "nth" degree. That said, it's cool to see that steel is being pushed farther. Hopefully it'll improve the breed. Time will tell. However it all shakes out, I will be keeping the steel steeds around awhile, that's for sure. Dag-nabbit! I forgot my camera again! Well.....not that it was all that exciting. One other rider showed up, and wouldn't ya know it- another Trans Iowa V8 finisher shows up. Robert Fry and his Vaya. It made for an "all-Salsa Cycles" ride. You'd never guess Mr. Fry had just done 300 plus brutal gravel miles about two weeks ago. He hammered me pretty good last night! Not only that, but the wind was pretty strong out of the Northwest, making our heading out even tougher. By the way- for you folks that rode last week, the gravel was waaaaay smoother. So even though it wasn't all that exciting, the ride was tough for me- at any rate. Just what I needed. A good kick in the junk! 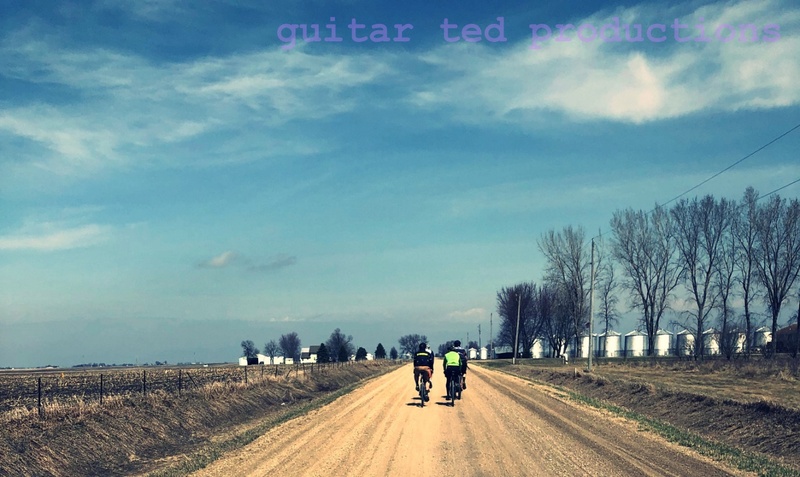 Guitar Ted Death Ride Invitational: Update- By the sounds of the comments from yesterday, Grinnell will be the base for operations for this years ride. This does a few things: It makes the place easy to find for out-of-towners, since it is right off Interstate 80. It has a killer sandwich/bar joint, a killer pizza place, and several other places for grub before/after the ride. It allows us the opportunity to hit some crazy minimum maintenance stuff, and we can look at a bit of the T.I.V8 course. Gravel Ride Tonight! If you are a local, don't forget the "3GR" tonight which will again start at Gateway Park in Cedar Falls at 5:30pm. I'm planning on about a 25 mile route, basically more of the same from last week. I cut last week's short due to the sketchy looking skies, but this time the weather is supposedly going to be stellar. In the future we'll do different routes, so stick around for some fun stuff hopefully every Friday all summer long. Speaking of gravel rides... The next big deal I have going on will be my "Guitar Ted Death Ride Invitational" which is slated for July 15th, 2012. Now, every year I have to say this, but this isn't a race, and it isn't exclusive. It is a gravel group ride of at least 100 miles or a bit more in a day. we never leave anyone behind, and anyone that is up to it is welcome. last year I had 12 or so folks show up and we had a blast. This is a free, unsupported event. You are responsible for you! I have to come up with a route, or I could do last year's again. I may do a route out of Hickory Hills, the Grinnell area, or up in Northeast Iowa again. Anyone want to sway my opinion? Hit me with a comment. And More Gravel Related Stuff! The other day I posted on Gravel Grinder News about the new Kona Rove disc gravel grinder bike coming out later this summer. The image here is of a prototype, so that isn't the final color, most likely. Paint it orange though and say "Salsa La Cruz". See any resemblance? I sure do. Funny thing about the La Cruz is that it was lamented after it was cut from the line. The Vaya kind of took its place, but folks still longed for that "classic" cross bike profile with big tire clearances and disc brakes. Well, we'll see how many catch on to the Rove here. The Kona site says this is a gravel grinder/tourer/commuter. 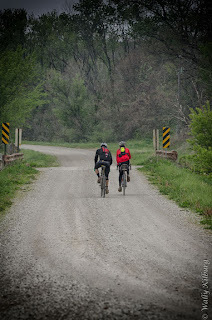 The fact that they even use the term "gravel grinder" is a big deal for us that do just that with ou bicycles. It means the marketing machine thinks this genre is big enough to market to. Weird in a way, since we've all been out there doing this for ever anyhow. But still.....it's nice to be recognized! Kona also says that this bike's geometry isn't "too long and low". Now that has me scratching my head, because what cyclo-cross based bike is long and low? A peek at their geometry chart doesn't reveal anything very forward thinking either. It isn't bad, mind you, but it isn't anything to write home about. No- it's just good, solid, safe geometry folks will get along with just fine, I suspect. It'll be interesting to see if they sell anymore of these than Salsa did before they cut the model out of the line up. Okay, that's all for today folks. Go ride yer bikes, take some pictures, and have some fun. March was a blistering, dry month. it left many to wonder if April and May would be more like July and August. Things were dry. Really dry, and the potential for drought was very real. My, what a difference a month or so makes! We got colder and wetter in April, and now the rivers are full again, the plant life is lush and green, and well......it's more like Spring! Since it was May, I had to drive up to Cedar Bend and ride, because the gates are opened May 1st for cars. The trails were fantastic, albeit wet from the previous day's rain. Oddly enough, horse traffic has damaged things up there a bit. Pock marks that weren't there before. Erosion. Then add in the bohunk that took some end loader through there to clear out the underbrush. Hey, here's a news flash for ya- "Single track" doesn't mean wide enough for a D-9 Cat. Sheesh! I get it though. One guy can clear out a trail in one tenth the time it takes to do it the right way. With county budgets being stretched thin, I bet this made more sense from the government standpoint. Too bad it is ugly, stupid, and hurts the trails more than it helps them. In my experience, once you make a trail wide by using a motor vehicle, other motor vehicles will follow, because they can now. I'm telling you, I won't be at all surprised to see ATV tracks back there this season. Just wait and see. I got in the rare double yesterday. The middle of the day saw me over at George Wyth State Park to do some single speeding. The place is perfect for that. Gears? Ha! Not necessary in this terrain. The CVAST group has been doing a bang-up job of maintaining these trails and adding cool new sections. Not only that, but they have a fun, social ride every Wednesday evening. All that riding and trail work means the trails are buffed out like a pretty penny. The rain that rained on Cedar Bend obviously did not reach Geo Wyth. It was dry, fast, and clean. Totally different than the duff ridden, soft, muddy in spots Cedar Bend, and that is odd. Really odd, because Cedar Bend is always drier than anywhere else. Well.....except for this time! I rode from one end to the other, taking in almost every trail out there. It was pretty fun too. The single speed I rode had the Gates Carbon Drive on it which is geared for places requiring some moderate amount of climbing. That meant that at Geo Wyth, I was spun out almost the entire time, but I still was grinning. Geo Wyth is not only flat, it is infested with somewhat people friendly, four legged wood rats, otherwise known as deer. I ran across several of them yesterday. A couple actually looked annoyed at me as I disrupted their gnawing of vegetation. Whoops! "S'cuse me!" I guess it'll all work out in the end. Just like a buddy of mine's situation. He got some bummer news that actually was timed perfectly. If it all works out, and it looks like it should, he'll be back amongst us Mid-Westerners and gravel grinding his heart out again. That'd be cool for him and great for us. Just like our dire weather situation ended up turning into one of the prettiest Springs in a long time. Who knew? Sometimes things really do work out for the best. I have this fat bike I call "The Snow Dog", but I may need to re-think that name. Maybe it should be "Muddy Mucky Mukluk"! Well, I have since put Big Fat Larry tires on it and it positively floats on softer grounds. Really. It is a noticeable difference from 3.8"ers to 4.7"ers. And this translates to mud, boggy, and wet areas well. I have been searching out the wettest, muddiest spots on my commute to work after rains, and especially when the frost was coming out of the ground back in early March. What I have found is fun. (Also being very sensitive to staying off trails that don't need tearing up, by the way.) I guess it must be the boy in me that never grew up, but hitting the mud puddles has been fascinating. Trying to see just what I can get through, and having Larry treads makes it tough sometimes. They slip and slide around a bit, making things more interesting. However, they never cease to float, so it becomes a game of balance and power transmission. I find it to be a fun game. But it isn't everyone's cup-o-tea. I've made a few attempts at cleaning the Snow Dog since winter, but it never lasts very long, nor gets completely finished. Always another rain, more mud, and more goo to tackle out there. So it ends up being a constantly changing palette of mud splattered blue powder coated aluminum. The wheels are particularly bad! I really need to pull the (probably) rotting cloth rim strip off and replace it with something like my chrome duct tape. Or maybe orange. I think some orange skewers and seat collar are in the offing for sure, but that's really just window dressing. Besides, it'd all just get covered in mud right away anyhow! Geared Up- Ready to go! Well, I have been tinkering with a few bikes of late. The big thing is gearing for the "Orange Crush". I had a compact road bike crank on it with 50/34T gears. I was always in the 50 since dropping to the 34 was so momentum sucking. I would only use it for a bail out situation. Fortunately, FSA has cyclo-cross rings for the Shimano crank that work brilliantly for what I was wanting for gravel road riding. The gearing now is 46T/36T. This is important for those times when you are speeding up a hill, and momentum is slipping away faster than you can go through gears out back. Then you simply dump the front down, spin away, and hopefully attain the crest of the hill without stressing the power muscles to much. In fact, I am a "masher" and not prone to switching up gears on a derailleur bike on gravel. I tend to "live with" a gear. The shorter disparity between teeth count up front now is more conducive to my way of riding, since many times I'll just toggle the front chain rings back and forth while leaving the rear end mostly alone. So, I've only gotten one ride on the set up so far, but I am already smiling. This should work well. More BMC changes- I mentioned that I had a Bontrager carbon fork on the BMC for awhile with fenders as well. I decided the Orange Crush needed to be "stripped down" for summer and the fork change was easy enough while I was at it. I had ridden a 20 miler on a lot of fresh gravel Friday night on the carbon fork set up, so I went out for a "Super-moon" ride Saturday night after switching things out. Here are my impressions on the differences. The Carbon fork is stiffer: The old Bonty fork was definitely not as smooth as the steel fork is on higher frequency vibrations. That's sort of runs contrary to popular opinions on carbon forks, but there it is. The steel fork is simply smoother feeling in a noticeable way. The handling is.......very similar. I can't say there is any big difference in handling that jumps right out at me. If there is a difference, it is a very subtle one. On rough, new gravel, the carbon fork "pings" off-line a bit easier. The result is a tougher to keep straight bike with the carbon fork. Make no mistake, the steel fork can and does get bounced around, but not to the degree that the carbon one did. Less fighting the front end, more energy saved. So I am pretty happy with the steel fork change back. It will be sticking around on the bike now for good. Speaking of the "super-moon", I did get out and see it on the gravel Saturday evening. It wasn't anything all that unusual looking to me, but there ya go. I guess I can say that I got a great night time gravel ride in, and I still need a tripod for night time shots! I made do by sitting the camera on top of my head, but my breathing still blurred the image since I had the shutter time jacked wide open to get as much light time as I could to capture the image. I'm no "photographer", but I am learning how to operate this contraption better. Finally! I also bled some brakes on a bike Saturday, which isn't my favorite thing to do, because I hate DOT fluid that many of the brakes use. I used to have to work with it a lot in my car repair days, and the stuff is flat out evil. Not a fan at all. Mineral oil is cool, but it is slightly harder to get the air out of that stuff. Not impossible though. Well, besides that and feeling extremely lethargic after Trans Iowa, that about sums things up around here! Now back to "normal" life, hopefully. Note: All images by Wally Kilburg and Guitar Ted. Click to make bigger. I rode a nice, sedate gravel grinder Friday evening that included T.I.V7 and V8 finisher Mike Johnson and T.I.V5 and V7 finisher and volunteer on this years T.I.- Jeremy Fry. The chatter was heavily Trans Iowa, and it is quite obvious that this adventure stirs up memories and emotions for more than just myself. However; there is a lot more to life, and riding bicycles than just Trans Iowa. It is time for all of us to move on and do some other things in life and cycling for awhile. Volunteers: This year the volunteers for the event just hit a huge home run with the racers. I have never seen the out pouring of thanks specifically aimed at the volunteers as I have for this year's event. Thank You! I could never reward you enough, or at all. What you did was beyond measure, and if you are a volunteer from T.I.V8, you should be super-proud. This also extends to others who stepped up at a moments notice to assist wherever they saw a need to be met. Racers that had previously dropped out, bystanders, and support folks all pitched in at different intervals during the event. I owe you all a huge debt of gratitude. Grinnell Chamber of Commerce/Sheryl Parmley: Once again, I was floored by the efficiency, ease, and class shown by Sheryl. This just keeps getting better, and I so appreciate your help. The Race: This year, for Trans Iowa V8, I had some very specific goals. I set a very high bar for myself in certain areas. According to feedback I received from the racers, I think I can safely say I met all those goals. Trans Iowa Radio: I think this is the first year that I have ever done this and not received some negative feedback for not being more informative according to someone elses needs. Thanks for not commenting in that manner. It shows that the folks this year "got it". As far as the posts not going up, they all did but one. Tragically it was the one announcing Eric Brunt as the winner at about 7:30am Sunday morning. Bummer! "300 Miles of Gravel": Jeff Frings- that was freaking amazing! Nuff said. Pre-Race Meat-Up: Moving the time up an hour and the tweaks the Grinnell Steakhouse put in place really made for a smoother running pre-race this year. Electronics: The GPS is more common now and although it doesn't help you to navigate the course, riders were able to ascertain on a larger scale where they were heading. I'm not sure this is a big deal, but I am still ruminating on that facet of technology. Also- it was interesting to note that some riders were able to listen to my "Trans Iowa Radio" posts and figure out who the leaders were and how far up the road they were. I'm not sure that the leaders would use this information anyway, so I am only finding this amusing at this time. However; it is something that bears watching. Flying Solo: I must admit that I was a bit apprehensive about running the entire T.I.V8 course out there alone, but it worked out well anyway. Some folks were expressing concern over this, but I will tell ya- there wasn't any room for another person in my cab! The Future?- I won't publicly commit to another Trans Iowa just yet, but if I did....... There would be room to improve upon some major gains seen in this years event. I would still have those "high bars" that I set for T.I.V8, and there are some tweaks or things needing attention that could be touched upon for a next Trans Iowa. Oh yeah......and it would start and finish in Grinnell again, most likely. Thanks and Credits: (In no particular order), Grinnell, Iowa, The Grinnell Steakhouse and its employees, Jeff Frings, Steve Fuller (photography), Rob Versteegh, Craig Cooper, Wally Kilburg, George Keslin, Matt Gersib, Jeremy Fry, Matt Mishler, Oakley, Velocity, Wheel Werks/Jay Barre, Gu Energy/Adam Boone, Clif Bar, Ergon/Jeff Kerkove, the 13 year old girl in Attica, Europa Cycle and Ski (logistics, support), Tim Ek (post event), The Slender Fungus Cycling Association (support, volunteering, being super-fans), The DBD (for being you guys), "The Lincoln Crew" (long time supporters/fans/gravel aficionados), Iowa Momentum Magazine/Dave Mable (media coverage, being cool), all the Racers, their support, and everyone that was a fan over the weekend. Anyone that feels I missed thanking them- Thank You!! Trans Iowa V8: The Start- Wet And Windy!